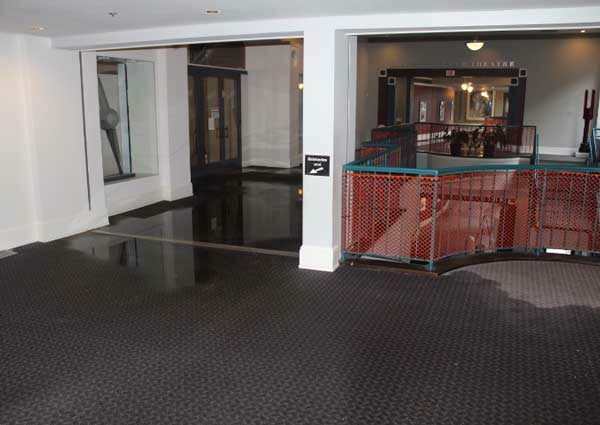 First Restoration Services received a call at 3:48 pm on December 27, 2011, regarding a sprinkler head that burst on the second floor caused water damage to the newly acquired East Wing of the Asheville Art Museum which was being remodeled. Water had migrated to the middle section of the building’s second, first and basement levels. The Museums’ art collection was in the North Wing and never in danger of being damaged by this event. Our first step in the response was to coordinate with crews at current jobs so that we could begin relocating some technicians from their current job sites to the Asheville Art Museum while maintaining ongoing work at our existing projects. Within 45 minutes, First Restoration Services had a crew on site extracting water. Within three hours of the call, First Restoration had 16 technicians on site with equipment. Subcontractors were also called in for safety evaluations. All the water was extracted within the first two hours, and then we started establishing temporary power and drying equipment. 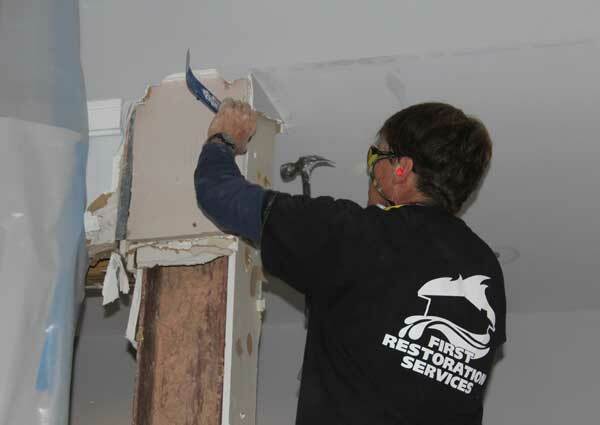 First Restoration Services’ 16 technicians were on site the first night of the response until 11:30 pm. The morning after the water damage, controlled removal permits were applied for. These permits require a third party company to test all materials that are to be removed. Complexity #1 – Applying for controlled removal permits took three days. First Restoration Services could not do anything in removal until these permits were received, putting a delay on the start of the removal process. In the meantime, we tracked moisture level readings and output readings on drying equipment, monitored overall drying process and set up containment for controlled removal. The public facility where this incident occurred houses three organizations who provide cultural programs seven days per week, throughout the day and in the evenings. First Restoration Services had to safely accommodate the use of the facility for these programs for both students and adults. For example, before First Restoration Services could take the next step in the mitigation phase, we needed to remove all equipment from the first floor public areas to accommodate one of the cultural activities scheduled. Following the event, First Restoration Services placed all equipment back in its proper place to resume drying. Complexity #2 – By having to remove the equipment to accommodate the needs of a joint facility open to the public with ongoing activities, we were delayed completing the project. The Museum Director recognized this and appreciated the flexibility we had shown in working toward the least possible disruption of staff and public programs. With the permits in hand, we began the controlled removal process. We started in the shared public areas which were of high importance to the Museum Director, Pam Myers. 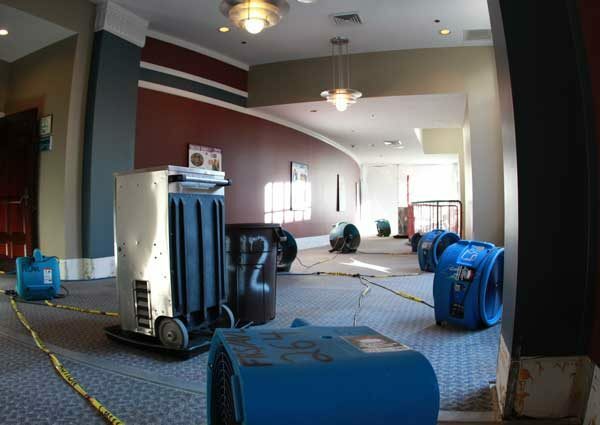 During this process, proper engineering controls were established: HEPA Vacuuming, Containment, Negative Pressure w/ HEPA Filtration & Floor Protection. 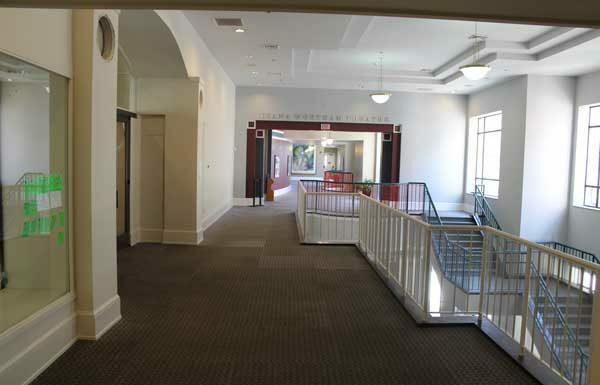 During the removal process, the carpet tiles first had to be top dried, then shimmed and turned over without losing their existing position, then dried again on the other side. Complicating matters, all baseboards had been screwed in rather than nailed, making the process of removal more challenging. Complexity #3 – The third complexity facing First Restoration came during the drywall removal. Technicians found anywhere from two to five layers of drywall whereas, typically, there is only one layer to be removed. One reason for the numerous layers was for fire protection.